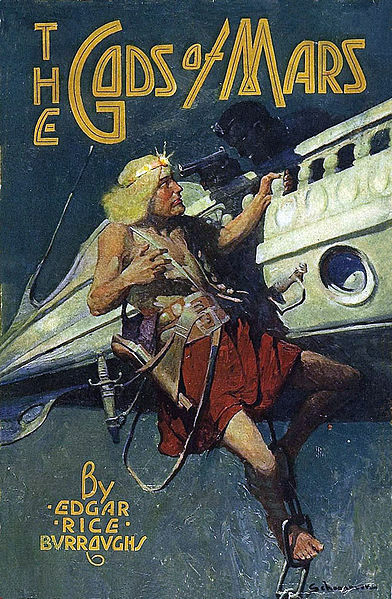 Pulp Cover Friday Presents: ERB! 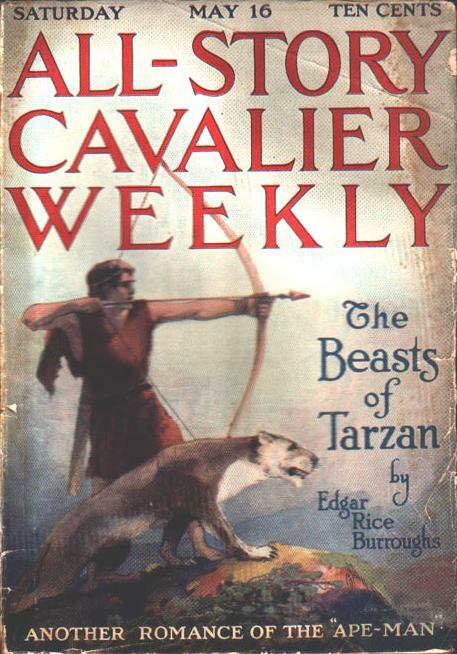 Edgar Rice Burroughs was a gateway author for a great number of science fiction fans of my age, and he and Andre Norton were the ones who drew me into the genre. 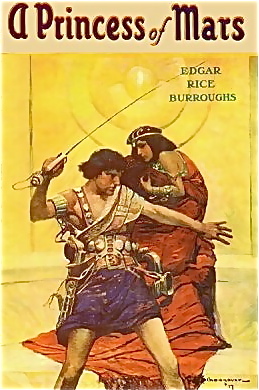 In celebration of the incipient release of JOHN CARTER, I thought we’d take a look at the initial appearances of Edgar Rice Burroughs’ earliest work in the pulps. 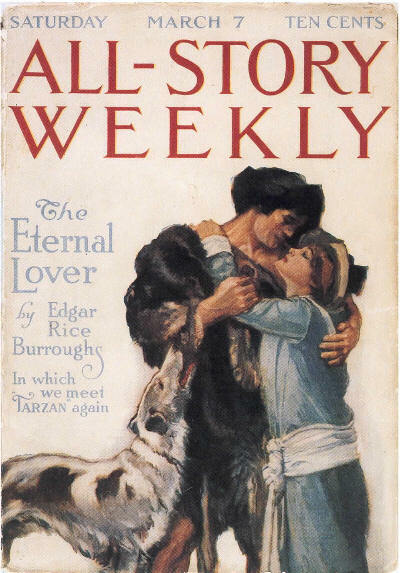 The magazine that printed most of his early work was THE ALL-STORY/ALL STORY WEEKLY, which originated in 1905 as ALL-STORY MAGAZINE, and under these three titles published 444 issues before being absorbed by THE ARGOSY in 1920. 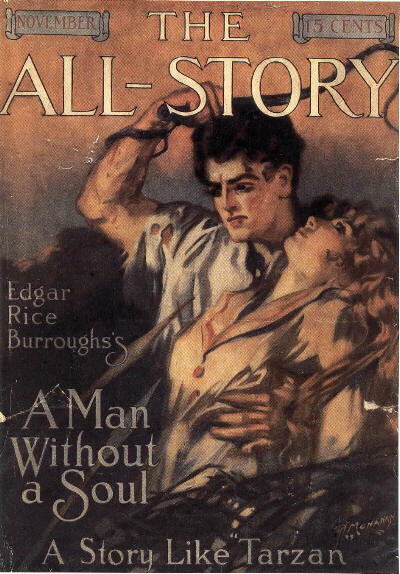 Burroughs’ first story was UNDER THE MOONS OF MARS (Feb. 1912) and was by-lined by Normal Bean (a punning pseudonym suggesting that the author, despite the crazy stuff he was writing, was a normal guy after all; the editors at ASW were either entirely humorless or missed the joke completely, because they credited the tale to “Norman Being”). 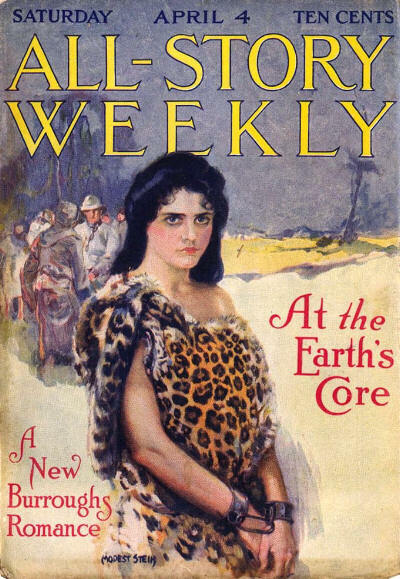 It was not a cover story, so what we have here is the cover of the 1st edition by McClurg, published in 1917 (as you see, not an immediate hit). 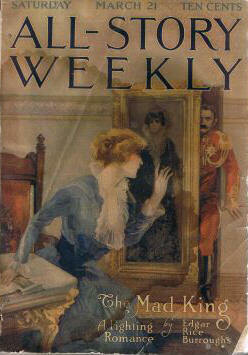 The novel is best known as A PRINCESS OF MARS. 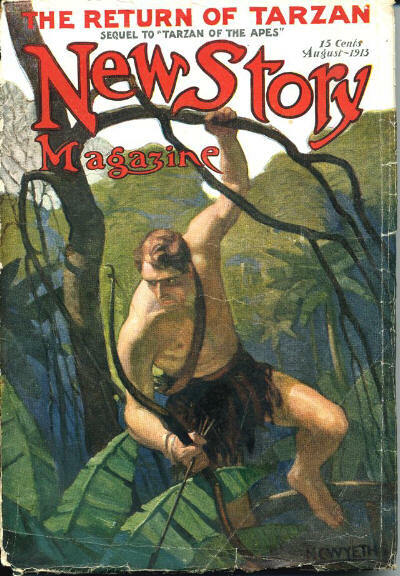 ASW wasn’t sufficiently impressed with Tarzan, I guess, so they let it go to the NEW STORY MAGAZINE. It wasn’t until the third installment (6-12-13) that it got the proper cover treatment. 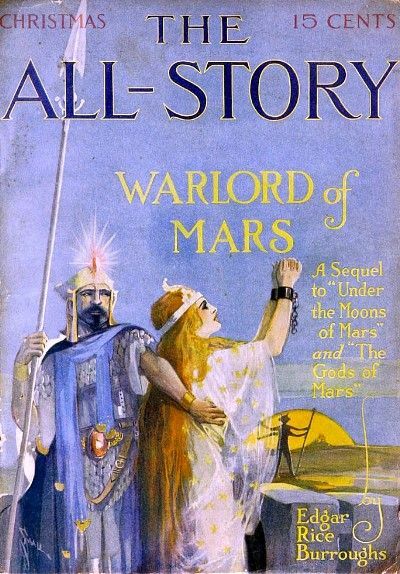 The next Mars book, THE GODS OF MARS (1-13), also didn’t make the cover for ASW. Here’s the McClurg 1st from 1918. 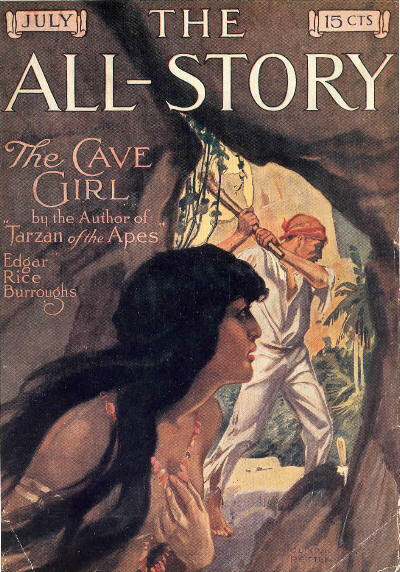 ASW did take this next (rather obscure) ERB tale and put it on the cover (7-13). 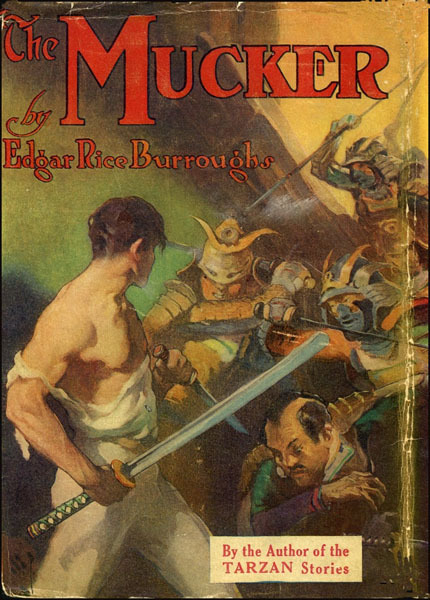 Nor did THE MUCKER (8-13) make the cover, so this is taken from McClurg’s 1921 edition. One of my favorite Burrough’s titles that, while non-fantastic, includes pretty much near every pulp genre ever invented. Also, an atypical Burroughs hero, with low class origins. Sequel to THE MUCKER (11-13). Mars finally makes the cover (12-13)! 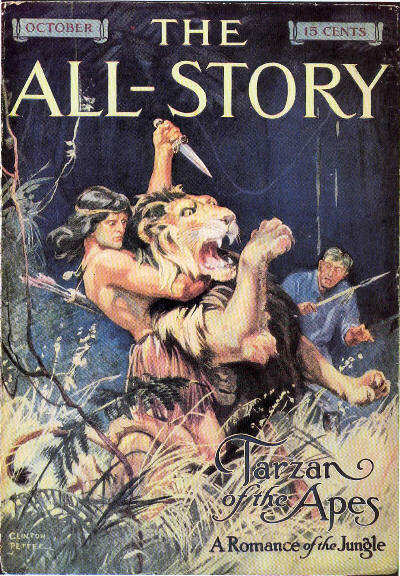 And, to end this session, Tarzan, again (5-16-14).